It’s the last day of Sushi Bonanza. My siblings love sushi, and I promised to bring them to Sushi King today. Yeewei together with Ivan came to my house and picked us, siblings and me up. Ivan suggested Summit USJ’s Sushi King simply because it’s the nearest. Reached there around 5.30p.m. There’s only one or two customers in front of us. We got sited after awhile. I got disappointed. – There’s not much choices as there’s only a few types on sushi on the belt. – Most of it is not fresh and appears to be unsavory. ughhh. – The waiter there is simply ill-mannered. I told myself, I will never go to this outlet anymore. Had a “few” plates, & I suggested to leave and go to a better outlet. 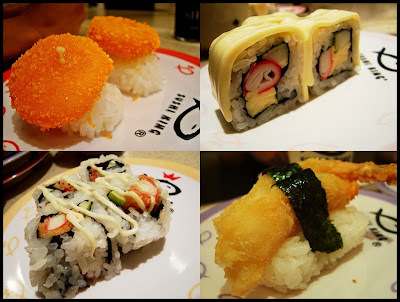 Then, we headed to Subang Parade’s Sushi King. The queue was scary, but Thanks to Yeewei’s who works over there, we got the best sits. The sushi served there is million times better. As a conclusion, if you are thinking of having meals at Sushi King. p.s. – Mathematics is much more interesting than what I thought it is. ;) Thanks to Miss Khoo. Aiyo. I missed it. But nevermind lar ;p i’m not a huge fans of sushi. lol…hehe sounds that summit sushi king outlet is really that bad…hmm this sushi bonanza is only offered once a year right? sushi bonanza hot topic now.. Went on last Tue at Queens Park.. My fren lagi geng, went twice ! Today last day people still queuing up just now, around 9pm already..
where is the best Sushi King..? at Low Yat Plaza.. hehee.. believe or not? Haha.. next time won’t run away from u loh, i keep my promise loh. anywayz, hope tat we can meet up b4 u went kampar lo. how come study UTAR adi de?? HAha.. I went for the sushi as well.. Alone I took around more than 20 plates, so I skipped meal during dinner time as too full d.. Haha.. Anyway, mind to come out and grab something to drink? Alvin – nop, it's twice a year. danieltong – lowyat plaza? I had never go there before. Destiny – haha. I agree. eh, where are you studying again? Ruki – wah.. how come noone want to eat de? smashpop – 99 plates. haha. Anon – thanks to PTS. Zues – 20+ plates?!! you alone?!! *respect* & you are so skinny, unfair. dvst – uh?! how come?